With little more than a run-down Jeep and their newborn baby in tow, author Micah Perks’ parents set out in 1963 to build a school and a utopian community in the mountains. The school would become known as a place to send teens with drug addictions and emotional problems, children with whom Micah and her sister would grow up. This complex memoir mixes a moving celebration of the utopian spirit and its desire for community and freedom with a lacerating critique of the consequences of those desires — especially for the children involved. How could the campaign for a perfect home and family create such confusion and destruction? The ’60s, for many, became a laboratory of hope and chaos, as young idealists tested the limits of possibility. 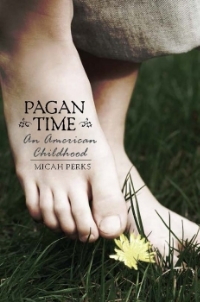 Micah Perks has cast her unflinching and precise eye on her own history and has illuminated not only those years of her childhood, but a wide-open moment that marked our culture for all time. Pagan Time is now available as an audiobook on Audible.com. The valley in the Adirondacks where Micah grew up. The main house of the commune burning down.